Read-Only Volume Mounts Display as "rw"
[Feature Improvement] Loggregator agent egresses preferred tags instead of DeprecatedTags in loggregator envelopes. This fixes a high CPU issue in Doppler cluster. [Bug Fix] Apps using a Docker image from an insecure registry configured in the Private Docker Insecure Registry Whitelist can now be staged successfully. [Bug Fix] Bump Cloud Controller to no longer return a “503: Stats Server Unavailable error” when container metrics are not available. [Bug Fix] Set cloud controller staging timeout value on all cloud controller jobs to allow large apps to stage before the timeout. [Feature Improvement] Allows PCF Metrics to be installed with both v1.5 and v1.4 versions to prevent dataloss. When binding a service instance, notify the user to restage their app from the CLI. When logged-in user can see no apps, show “No results” instead of “Loading…” in the app search. [Feature Improvement] Increase UAA session cookie max age to 8 hours. [Bug Fix] Bumps autoscaling-release to v104.3 to use CF CLI v6.36.1. [Bug Fix] Bumps capi-release to v1.44.32 to prevent duplicate app usage events. Introduce custom memory limit setting for Apps Manager and invitation apps. Show full page error when critical env vars are not set. App last push time now reflects time of most recent ready package. Introduce flag to hide app search bar. App search bar queries apps only when focused. Tell user to re-stage app after binding a service. Fix invite member email input. [Bug Fix] Fixes a bug that caused the Cloud Controller sync job to fail when pushing an app with TCP routing enabled, which causes Diego to not know if its desired state is consistent with Cloud Controller. [Feature Improvement] Bumps capi-release to v1.44.31 to improve database connection validation. [Bug Fix] Bumps capi-release to v1.44.30 to prevent app upload from failing when the app has broken symlinks. [Bug Fix] Bumps autoscaler-release to v104.2 to fix issue where brief periods of cloud controller downtime could cause autoscaler to become disabled. Reintroduce cache busting for js/css files. Fixed a bug that would cause apps manager to fail to load when environment variables contained newlines. Fix headers for endpoints that we serve. Updated the CF CLI that is used to push Apps Manager and Invitations. [Feature Improvement] Updates the Small Footprint PAS tile name from “PCF Small Footprint” to “Small Footprint PAS”. [Feature Improvement] Adds bosh-dns alias for UAA. This allows service brokers deployed as applications to resolve UAA’s DNS address and authenticate. [Bug fix] Bumps apps-manager-release to v663.0.11. [IE] Fixes alignment of the app search bar in the header. Checks if the user has permission to view autoscale bindings before making the request, which prevents the app page from having an error when refreshing. Fixes a bug that prevented mid-level fetch tasks from being cleared when switching routes and on the 30 second refresh. Fixes a bug that caused marketplace service plans to show “No price available”. Updates JDK version to 8u162. CVE-2018-1266: Fixes random number guessing exploit. Removes backends on any error to prevent 502 errors from being returned to clients. [Bug Fix] Removes unneeded persistent disk from diego brain vms. [Feature Improvement] Bumps apps-manager to 663.0.10, which uses nginx and the staticfile buildpack. [Bug Fix] Cloud controller is configured to set cc.diego.pid_limit to 0 (unlimited) so that application instances which created many threads do not crash. The previous limit was defaulting to 1024. Note: Due to an update to garden-runc-release, Pivotal recommends that you re-create all VMs when you upgrade to PAS v2.0.7 and later without also updating your stemcell. See Some Upgrades Require VM Re-Create for details. [Feature Improvement] Bumps garden-runc-release to v1.11.1 which includes grootfs root filesystem by default. [Feature Improvement] Patches cloud controller so users with admin_read_only scope can view stats for apps, which is needed by the cf v3-apps command. [Security Fix] Patches routing-release for CVE-2018-1221. [Bug Fix] Enables privileged containers to support upgrading from ERT 1.11 with apps that specify privileged containers. [Feature Improvement] Adds credentials for Healthwatch alerts. [Security Fix] Bumps apps-manager-release to v663.0.8 to fix vulnerability that allowed arbitrary file access on server. [Bug Fix] Bumps usage-service-release to v664.0.11 to increase memory footprint to avoid occasional crashes. Allows HTTP-based health check on an HTTP endpoint that expects TLS-terminated traffic. Fixes issue that prevented Windows apps sub-process logs from being captured. [Feature Improvement] Patches uaa-release to add healthwatch.admin group to the UAA admin user and healthwatch_ui client, to allow configuration of alert thresholds on Healthwatch. [Security Fix] Patches capi-release to fix issue where refresh tokens are not accepted where access tokens are required. [Feature Improvement] Bumps syslog-migration-release to v10.0.1 and add a checkbox for log file forwarding through TCP to work around the Truncated Syslog Messages issue. [Bug Fix] Bumps uaa-release to v52.7. Fixed 404 page footer in IE. Fixed styling in accounting report download button. Fetch all routes for spaces instead of just the first page. [Bug Fix] Patches capi-release to fix task sync issue that causes some tasks to mistakenly appear as failed when they actually succeeded. [Bug Fix] Bumps usage-service-release from v664.0.10 to fix issues with logging error output in the Bosh errand to push the app-usage-service. [Feature Improvement] The SAML 'Entity Id Override’ field has been moved from the Authentication and Enterprise SSO tab to the UAA tab in Ops Manager, to accompany the other SAML fields in the UAA tab. [Feature Improvement] Bumps mysql-monitoring-release to v8.13.0 to add disk usage metrics as a percentage. [Feature Improvement] Bumps mysql-backup-release to v1.38.0 which enables mutual TLS between the backup node and server. [Feature Improvement] Application containers can be configured not to use BOSH DNS with the Disable BOSH DNS server for troubleshooting purposes checkbox on the director config in Ops Manager. [Bug Fix] Bumps java-offline-buildpack to v4.7.1 to address an issue with multiple java-offline-buildpacks being included, which may cause deployments to have different versions of java-offline-buildpack installed. It is now possible to specify a ProcessSpec.Image. Processes can now have their own filesystem view. Limitation: APIs such as BulkMetrics and Process.Signal may not work immediately after container.Run(ProcessSpec) returns for processes with Image and/or OverrideContainerLimits specified. This will be fixed in future releases. Increased disk size on clock_global VMs from 2GB to 20GB to address scenarios where disk utilization is too high. This may be addressed in a future release. The procedure for upgrading to Pivotal Application Service (PAS) v2.0 is documented in the Upgrading Pivotal Cloud Foundry topic. To successfully upgrade to PAS v2.0, you must first upgrade to a version of Elastic Runtime v1.12. Some partner service tiles may be incompatible with PCF v2.0. Pivotal is working with partners to ensure their tiles are updated to work with the latest versions of PCF. For information about which partner service releases are currently compatible with PCF v2.0, review the appropriate partners services release documentation at https://docs.pivotal.io, or contact the partner organization that produces the tile. Note: Port 8853 is the destination port for communications between BOSH DNS health processes. Ensure your firewall rules allow TCP traffic on 8853 for all VMs running BOSH DNS. For more information, see BOSH DNS Network Communications. PCF now forwards BOSH health metrics generated for all VMs in a deployment to the Loggregator Firehose by default. For more information about this feature and its implementation, see the BOSH System Metrics Forwarder section in the Overview of the Loggregator System. Stop using PCF JMX Bridge to consume BOSH component metrics outside of the Firehose. 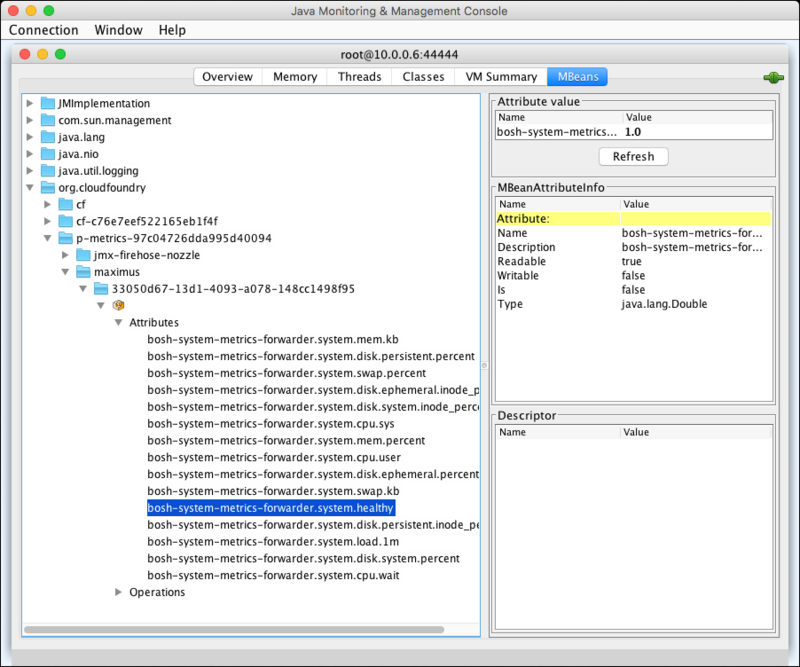 See Preventing Duplicated BOSH Component Metrics in PCF JMX Bridge for additional instructions. Uninstall the BOSH HM Forwarder. For guidance information about configuring Ops Manager Director, see the Ops Manager installation topic for your IaaS. Because BOSH component metrics now come from the Firehose, their namespaces are different in PCF JMX Bridge. For an explanation of how metric names differ between PCF 2.0 and earlier versions, see the following table. The BOSH Director delivers the metric name. 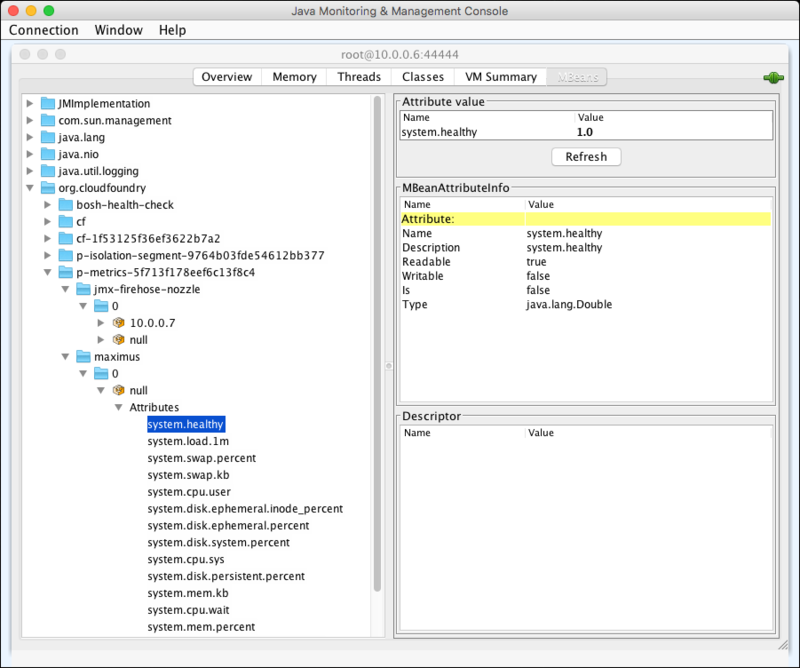 The metric is nested in the tree structure by deployment name, VM name, VM instance number, and attributes for that VM instance. The sub-node of VM instance number is always named null. The Firehose delivers the metric name. The tree shows the VM GUID instead of the VM instance number and the sub-node is always empty. This namespacing affects all previous BOSH health metrics. The trust between the Gorouter and HAProxy enables mutual authentication between applications that run on PCF. The Gorouter and HAProxy are configured with the root certificate authority. This occurs automatically within PCF. When validating client requests using mutual TLS, the Gorouter trusts multiple certificate authorities (CAs) by default. Operators can now configure the Gorouter and HAProxy to trust custom CAs in addition to well-known, public CAs and Ops Manager Director Trusted Certificates. For more information about configuring this feature, see the PAS installation topic for your IaaS. PCF now supports XFCC header configuration for deployments that terminate TLS for the first time at HAProxy. In addition, the selection options for this configuration field have been renamed to reflect differences in XFCC configuration based on TLS termination entry points. For more information, see the PAS installation topic for your IaaS. Several internal credentials, the secret and simple_credentials that PAS uses for inter-component communication, are now generated and stored in BOSH CredHub instead of the Ops Manager database. This is part of an ongoing effort to migrate all credentials to BOSH CredHub, which will reduce the amount of places credentials are stored, aid in credential rotation, and increase security. For information about the internal credentials that were migrated to BOSH CredHub in 1.12, see the Migration of Internal Credentials to BOSH CredHub section of the Pivotal Elastic Runtime v1.12 Release Notes topic. To access the following credentials, you must use the CredHub CLI or the Ops Manager API instead of accessing the Credentials tab of the PAS tile. For instructions about retrieving PAS credentials, see Retrieving Credentials from Your Deployment. PAS v2.0 adds support for VMware NSX-T networking. NSX is a networking solution for VMware that provides a firewall, load balancing, and NAT/SNAT services for PCF. NSX-T is intended to work across multiple clouds and provide networking for container platforms. Previous versions of PAS supported NSX-V networking. In the Networking pane of the PAS tile, under Container Network Plugin Interface, select External. Operators can additionally use the NSX Manager to configure policies for PCF applications. See the NSX-T Container Plug-in for Kubernetes and Cloud Foundry - Installation and Administration Guide for more information. The PAS tile now includes its own runtime CredHub VM to securely store the service instance credentials that apps use to access services. Previously, PCF could only use the Cloud Controller database for storing these credentials. PCF operators must follow the steps in Securely Storing Service Instance Credentials with PAS CredHub. For information about configuring CredHub in the PAS tile, see the Configure CredHub section in the PAS installation instructions for your IaaS, such as Deploying PAS on GCP. To store service instance credentials in runtime CredHub, PCF service tile developers must modify their service tile as described in Securing Service Credentials with Runtime CredHub. The Spring Cloud Services tile is the first service to support storing its instance credentials in runtime CredHub. For more information about CredHub in PCF, see the CredHub Documentation. Breaking Change: If you opt out of the BOSH DNS feature, your PCF deployment cannot support Secure Service Instance Credentials feature. The PAS tile no longer includes individual errand VMs. Instead, the errand jobs are colocated on other VMs in the deployment. Colocated errands run faster than traditional errands and use fewer resources, including disk and IP space. These errands are now set to always run by default. A context object is sent to service brokers when provisioning a service instance containing platform-specific information, such as the organization and space GUIDs. PAS v2.0 adds the same context object to binding requests. If the service broker wants to make decisions based on the organization or space GUIDs in which the binding is created, it can do so. For more information, see Open Service Broker API. The Syslog Scheduler is now scalable. The number of Syslog Scheduler instances defaults to 2. This is the minimum number of instances necessary to make the syslog drain highly available. Apps Manager includes a new option to bind the Metrics Forwarder service to an application. To do so, go to Services and click Add a Service. Apps Manager includes a new option to bind the PCF Scheduler service to an application. To do so, go to Services and click Add a Service. Apps Manager includes a new option to bind the App Autoscaler service to an application. To do so, go to Services and click Add a Service. To access the configuration panel for App Autoscaler, click Manage. In Apps Manager, the app page Settings tab shows multiple buildpacks for apps pushed with multiple buildpacks. Apps Manager now integrates the Spring Boot Actuator /mappings endpoint. This endpoint displays the endpoints an app serves and other related details. For more information, see Using Actuators. The PAS v2.0 release on Pivotal Network includes Terraform template downloads. Terraform is a tool for creating and updating infrastructure resources that helps provide a better and more consistent PCF install experience on multiple IaaS providers. PCF internal development teams maintain and test Terraform templates in many scenarios. Installing PCF on GCP using Terraform. Installing PCF on AWS using Terraform. Note: The AWS Terraform template replaces the PCF Cloudformation for AWS Setup file on Pivotal Network. Operators can now enable self-service network policies for Space Developers. Prior to this release, enabling access occurred on either a per-developer or per-group basis. For more information about enabling this feature, see the Installing Pivotal Cloud Foundry topic for your IaaS. If your PAS deployment is on GCP and you want to use Runtime CredHub, you must select Internal for both your system databases and CredHub database. If you are using external system databases, you cannot use CredHub. CredHub is not compatible with the external database option on GCP. GCP Cloud SQL presents its certificate in a way that CredHub refuses to connect to it. In all versions of PAS v2.0, disabling the HTTP listener for the Gorouter and HAProxy will cause clients to receive 502 responses for requests to routes that are bound to a route services that are run as apps on the platform. Route services that are run externally are not impacted. To support route services run as apps on ERT, HTTP must remain enabled. In PAS v2.0.0 through v2.0.5, Diego cells using the GrootFS component fail to run application instances whose internal specifications require a privileged container. This defect affects buildpack-based applications last started on Elastic Runtime v1.8 or earlier. Manually restart any apps that are affected. The task cancels before completing. The task is reported as a failure even if it finishes successfully. PCF now forwards BOSH health metrics generated for all VMs in a deployment to the Loggregator Firehose by default. See BOSH Component Metrics Available in Loggregator Firehose for more information. The new flow of BOSH component metrics cannot be disabled. Therefore, if you are currently using the PCF JMX Bridge tile to consume them, you may receive duplicate data. To prevent this, delete JMX Provider IP Address in Director Config of your Ops Manager Director tile. Deleting the IP address means that BOSH component metrics will no longer be sent to JMX Bridge using the direct connection from the BOSH Director to the JMX Provider. As these BOSH component metrics are now available in JMX Bridge by default through its Firehose nozzle, breaking the prior direct connection by deleting the JMX Provider IP address prevents the duplication of BOSH metrics for JMX Bridge consumers. PAS forwards a high volume of DEBUG syslog messages from UAA and other system components to an external service. To remediate this issue, you can filter out log messages that contain "DEBUG" in their body by using the if ($msg contains "DEBUG") then stop custom syslog rule. For information about enabling syslog forwarding and configuring custom syslog rules in PAS, see Enable Syslog Forwarding in the Configuring Logging in PAS topic and Exclude Logs With Certain Content in the Customizing Platform Log Forwarding topic. Note: This issue is remediated when you select the Use TCP for file forwarding local transport option. For more information, see System Logging. If the total length of a syslog message transported locally from a PCF system component (for example, the Cloud Controller or a Diego cell) is greater than 1,024 bytes, the packet is truncated before it reaches RSYSLOG installed on every BOSH VM instance. In PCF v2.0, a job writes log messages to a file in the /var/vcap/sys/log directory, and then syslog-migration-release forwards the messages to RSYSLOG. For reading log files from the /var/vcap/sys/log directory into RSYSLOG, the release uses blackbox. Because blackbox is configured to send log messages over UDP, it causes the underlying library to respect the message length restrictions of RFC 3164 and truncate packets. For more information, see syslog Message Parts in the RFC 3164 documentation. Prior to switching to syslog-migration-release in PCF v1.11, when a job generated a log message, it typically wrote the message in two locations: to the /var/vcap/sys/log directory and to RSYSLOG. For writing log messages directly to RSYSLOG, jobs used logger, an Ubuntu utility. If jobs are using the default version of logger installed on the stemcell, logs longer than 1 KB are truncated because the utility has a hard-coded message length limit. If jobs are using a newer version of logger without this restriction or other tool to communicate with RSYSLOG over UDP, the truncation may not happen. As mentioned above, jobs write system logs to the /var/vcap/sys/log directory. You can download full log lines from the directory files using Ops Manager. Due to an underlying kernel defect, read-only volume mounts display as "mode": "rw" when you view the VCAP_SERVICES environment variable for your app. For more information about binding a volume service, see Using an External File System (Volume Services). If you configure PAS to use Internal MySQL, ensure that you select Disable Automated Backups of MySQL under the Automated Backups Configuration field. Pivotal does not support restoring the internal MySQL database from a full backup because it degrades the Galera MySQL cluster. To back up and restore the internal MySQL database, you must use BOSH Backup and Restore (BBR). See Backing Up and Restoring Pivotal Cloud Foundry for information on using BBR. BBR locks the necessary APIs as part of the backup procedure. This release-level backup ensures correctness. See PAS Component Behavior During Backup. BBR backs up the MySQL cluster and the blobstore together so that they are consistent. BBR eliminates the need to manually remove the silk database table after restore. For more information on this issue, see the following Pivotal Knowledge Base article: Restore from PAS Automated Database Backup is Not Supported in 1.11 and later. The gorouter.latency.uaa metric is only emitted in PCF v2.0.11 or later. For more information about the gorouter.latency.uaa metric, see UAA Request Latency in Key Performance Indicators. This section describes an issue and workaround related to configuring a list of TCP Routing Ports in the PAS tile UI. Note: This procedure causes brief downtime for TCP apps listening on ports that you open after deploying PAS. Configure PAS with Enable TCP Routing selected. Enter one port you want to use in the TCP Routing Ports field. Use the Routing API to add all desired TCP ports by following the instructions in the Modify your TCP ports section of the Enabling TCP Routing topic. When using the Routing API, you can include a comma separated list of ports. Above approximately 40 Doppler instances and 20 Traffic Controller instances, horizontal scaling is no longer useful for improving Loggregator Firehose performance. To improve performance, increase CPU resources for the existing Doppler and Traffic Controller instances to add vertical scale. The Advanced Features section of the PAS tile includes new functionality that may have certain constraints.